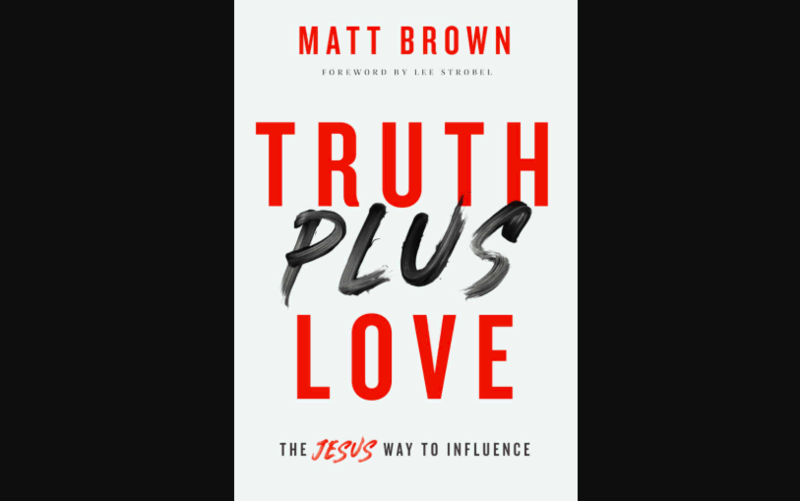 Evangelist, author and founder of the ministry Think Eternity, Matt Brown, just released his forthcoming book, “Truth Plus Love: The Jesus Way to Influence.“ In it, Brown encourages Christians to do a better job at representing the love of God while telling unbelievers about the truth of Jesus. In an interview with Faithwire, Brown explained why he thinks the modern megaphone of social media can be problematic, while sharing how Christians can use it to effectively advance the Kingdom. “The reality is all of us have more influence than we realize with people around us, but also social media has now allowed us to potentially influence hundreds or thousands more — more quickly than ever before in history,” he said. He pointed out that when you decide to follow Christ, you become an ambassador of Christ. From that point on, the way you act will affect how people see Christ. “John writes about Jesus when he says, ‘The Word became flesh and made his dwelling among us. We have seen his glory, the glory of the one and only Son, who came from the Father, full of grace and truth,'” he said, citing John 1:14. “Additionally, Paul ties these two great themes of the Bible together in Ephesians 4:15 saying, ‘We will speak the truth in love, growing in every way more and more like Christ, who is the head of his body, the church,'” he added. This is where Brown got the inspiration for his book title, “Truth Plus Love,” because as Christians, he believes we should be constantly growing in those two things. How should Christians act compared to non-believers? There must be a distinct difference in the way Christians disagree, and how the rest of the world disagrees — if not, there is a problem. Brown explained that Schaeffer’s sentiments are still important today, even more so because Christians have access to thousands of “friends” and often don’t think twice before sharing their opinion on the topics that are flooding today’s world. How should Christians vocalize their opinions? Brown was quick to point out that learning to disagree graciously doesn’t mean that Christians shouldn’t speak up or speak truth into the lives of others. In fact, that’s fundament to our faith. But he warns Christians about reacting to the news cycle in anger and spouting off opinions that are driven by that reactionary emotion. In an age where the internet is extremely accessible, it can be hard to learn how to use social media platforms in a way that glorifies God. Brown argued that social media can have both positive and negative ramifications. He shared the trap of comparison and the “fear of missing out” as two negative results while noting that there are good things that come from it as well. “For instance, it’s never been so easy to share the Gospel with everyone you know, and with less reason for fear, since you are behind a screen, not face-to-face,” he said. Brown explained that this new book has been the cry of his heart in his everyday relationships. “I long to grow in the fruit of the Spirit. For a long time, I had the wrong vision of what spiritual maturity looked like,” he explained. “I thought it was to be intense in my faith, but I’ve come to realize it looks a lot more like the fruit of the Spirit: more love, more joy, more peace, more kindness, more faithfulness and the like,” he said. Brown explained that people are drawn to people that embody the fruit of the spirit, and by trying to become more like Jesus, they will point others to Him. You can pre-order “Truth Plus Love: The Jesus Way To Influence” here.